#GiveGoodwill | Goodwill Industries International, Inc.
Stay up to date with custom content and alerts tailored to your interests. Give to "Goodwill Industries International, Inc."
When you give a financial donation to your local Goodwill, you help build brighter futures for people living in your community! Thanks to your support, our 161 social enterprises across the U.S. and Canada provide the skills training and assistance individuals need to find good jobs. Our staff offer a range of needed services, including onsite and virtual skills and employment training, job placement services and other community-based supports, such as career counseling, financial education and résumé preparation. 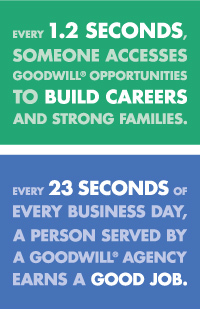 Every 25 seconds of every business day, a person served by Goodwill earns a new job. Watch the video above to learn more! Your donations make the difference. As a social enterprise and a nonprofit, we understand and operate on retail best practices though pursue a social mission focused on creating jobs and helping individuals find work. 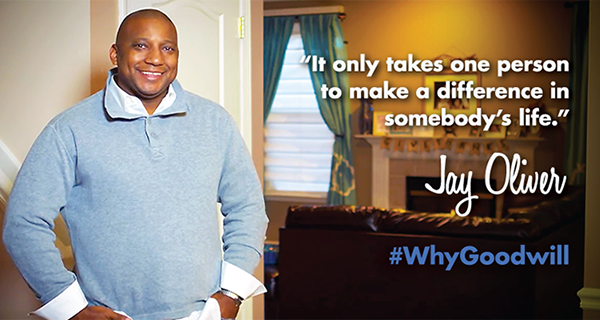 Learn more about how your donations create jobs for others. Your cash gift = Opportunity. Empowerment. Purpose. Whether donating your used goods or making a cash donation, your investment in Goodwill provides needed services to individuals seeking work. You make the difference. "GOODWILL®" is a registered trademark of Goodwill Industries International, Inc.
© 2015 Goodwill Industries International. All rights reserved.